The CM-3600a is a highly accurate, repeatable spectrophotometer that measures color quickly in any application. Oriented horizontally and made for benchtop use, the instrument has diameters that are interchangeable and can be used in a wide variety of measuring tasks. 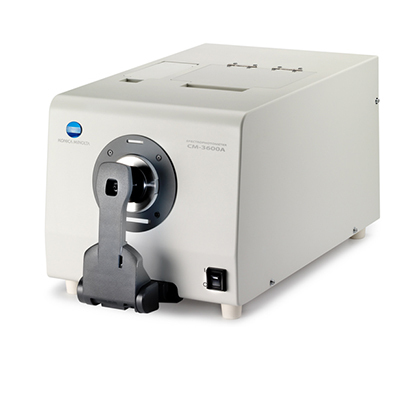 Konica Minolta designed the CM-3600A spectrophotometer with high-precision capabilities and great reliability. Its versatility and ease of use makes it a good choice in many measuring applications. Because it’s so easy to operate, it’s consistently among the most sought after benchtop spectrophotometers on the market. The CM-3600A spectrophotometer is a compact yet advanced instrument that features a side port in horizontal format and was built to measure a wide variety of objects’ reflectance. It also measures the transmittance of translucent or transparent liquids and solids – all this while taking up a minimum amount of space. The CM-3600A utilizes Konica Minolta’s patented Numerical Gloss Control system, eliminating the need for a mechanical gloss trap. By firing two xenon lamps in quick succession, the system can provide virtually simultaneous SCI (specular component included)/SCE (specular component excluded) measurements and also enable the calculation of 8° gloss. Accurate measurement of materials such as paper or cloth treated with fluorescent whitening agents (FWA) requires precise control of the UV component and its effects. The patented Numerical UV Control method used by the CM-3600A can provide such control by using proprietary calculations to combine the results from flashes of two xenon lamps: one with full UV energy, the other with UV energy removed by a UV-cutoff filter (either 400 nm or 420 nm). This method eliminates the need for mechanical filter positioning and repeated filter position adjustment, and enables UV adjustment by Whiteness Index, Tint, Brightness, or UV profile. For reflectance measurements, the CM-3600A employ di:8°, de:8° (diffuse illumination, 8° viewing) geometry which conforms to ISO, CIE, ASTM, DIN, and JIS standards. For transmittance measurements, the CM-3600A employ d:0° (diffuse illumination, 0° viewing) geometry which conforms to ISO, CIE, ASTM, and DIN standards. Opening the sample viewer provides a clear, illuminated view of the sample at the measurement port. On the CM-3600A, this view is reflected in a mirror on the sample viewer cover so that you can view it easily even while seated. Masks for the CM-3600A’s three measurement areas (SAV: Ø4 mm, MAV: Ø8 mm, and LAV: Ø25.4 mm) are included as standard accessories, so you can select the one that fits your measurement requirements. Since the CM-3600A utilize the same design and innovative technology as their predecessors CM-3600d and full data compatibility is assured. Data communication between the CM-3600A is performed via USB to offer higher speed. The CM-3600A is in full conformance with the RoHS (Restrictions on Hazardous Substances Directive) to ensure that they are environmentally friendly. Despite having a 152-mm integrating sphere and being packed full of advanced functionality, the CM-3600A is extremely compact, with a footprint about the same as a sheet of B4 paper or an average laptop computer. It can fit easily in a limited space while still providing the versatility and high accuracy of larger models. The sample holder opens approximately 90° for easy positioning of samples. It also has a new “soft-close” mechanism that prevents it from slamming shut and damaging samples or pinching fingers. Bright, clear sample viewer can be used even while seated. The sample viewer lets the sample be seen clearly at the measuring port for accurate positioning. When the sample viewer cover is opened, a high-brightness LED illuminates the sample to provide a clear image, and the cover is equipped with a mirror so that the image can be seen even from a seated position. Illumination / observation system Reflectance; di:8°, de:8° (diffused illumination, 8-degree viewing), equipped with simultaneous measurement of SCI (specular component included) / SCE (specular component excluded); Conforms to CIE No.15, lSO7724/1, ASTM E-1164, DIN 5033 Teil7 and JIS Z8722 condition C standard.